Step back in time at a festive 1920s cocktail party, Mar. 5. 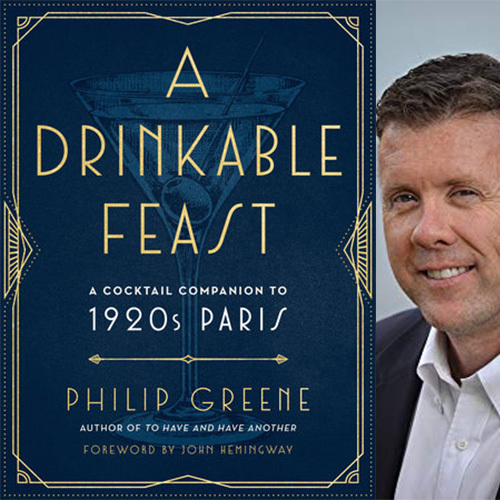 Cocktail historian Philip Greene will lead you on a journey back to the 'Roaring Twenties' with cocktails from his last book at a cocktail party and dinner at the Fourth Estate restaurant on Tuesday, Mar. 5. Diners will sample retro cocktails, including The Bees Knees and The Boulevardier, from Greene's latest book, A Drinkable Feast. Tickets are $75 single; $140/couple with a copy of the book included in the purchase price (one per couple). NPC members will receive a 15% discount in ticketing. His two previous book dinners have sold out - to be sure to reserve early! Greene is a trademark and Internet counsel to the U.S. Marine Corps at the Pentagon. He has written two previous cocktail books, “To Have and Have Another: A Hemingway Cocktail Companion,” and “The Manhattan: The Story of the First Modern Cocktail.” Greene is also a founding member of the Museum of the American Cocktail in New Orleans and has discussed his books and favorite cocktails at venues around the world.